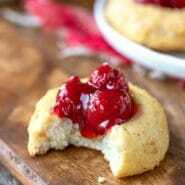 Butter cookies meet a slice of cheesecake in these tender Cherry Cheesecake Thumbprint Cookies that are perfect Christmas cookies or any other time cookies! Originally published 12/4/15. Updated with new photos and tips 12/8/18. Every year, we would make the same cookies for Christmas – spritz cookies and thumbprint cookies. Sometimes, we would make sugar cookies, too. The ones that always disappeared first, though, were the thumbprint cookies. I’m not sure why thumbprint cookies are so delicious, but they are! 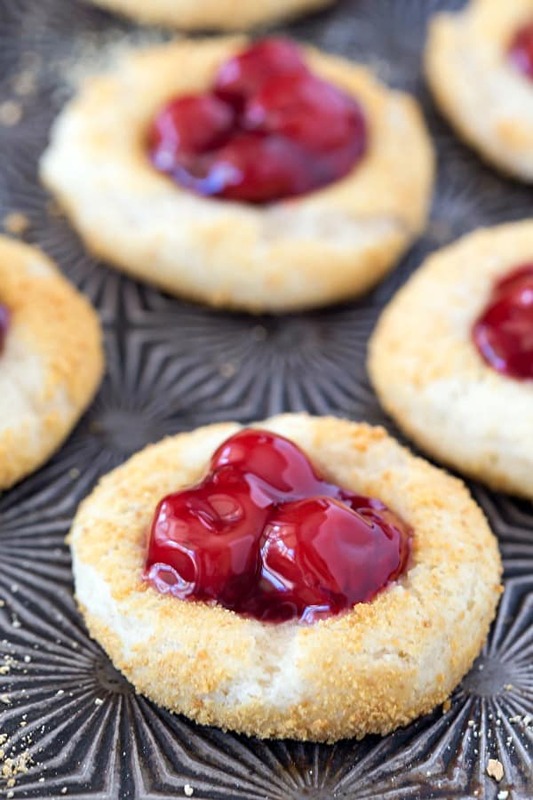 And these Cherry Cheesecake Thumbprint Cookies are no exception. The cookies are rich and soft and taste like a butter cookie crossed with a piece of cheesecake. 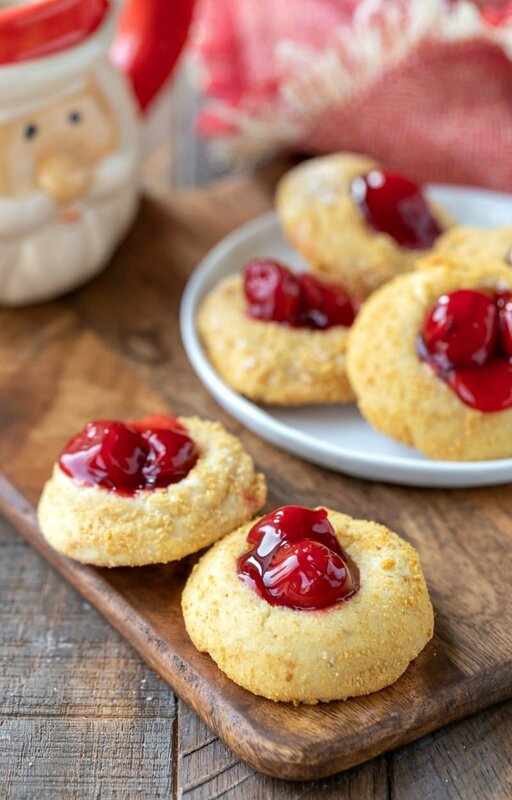 The cheesecake cookies are filled with cherry pie filling. It’s the perfect way to top these delicious cheesecake cookies. This dough is pretty straightforward. Begin by beating the butter and cream cheese together, and then mix in the egg. Next, mix in the vanilla extract. You can substitute up to 1 teaspoon of almond extract for up to 1 teaspoon of vanilla extract. Then, mix in the flour, baking soda, and salt. Avoid packing the flour as too much flour will give you a dry or doughy cookie. Bake the cookies, and then immediately press a 1/2 tablespoon measuring spoon into each cookie to create an indentation for the pie filling. Let the cookies cool for about 5 minutes, and then fill each indentation with cherry pie filling. These cookies are best stores covered in the fridge. 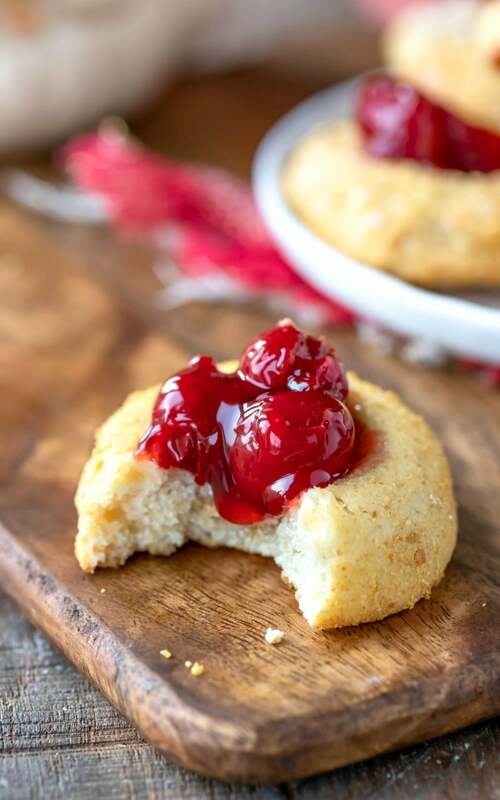 If you’ve tried this cherry cheesecake thumbprint cookie recipe, don’t forget to rate the recipe and leave me a comment below. I love to hear from people who’ve made my recipes! You can SUBSCRIBE to receive my latest recipe newsletters or FOLLOW ME on FACEBOOK, INSTAGRAM and PINTEREST for even more delicious food. Line two cookie sheets with silicone baking mats or parchment paper. In a large bowl, beat together the butter, cream cheese, and sugar until fluffy and well-combined. Beat in egg, scraping down the sides as needed. In a separate medium bowl, whisk together the flour, baking soda, and salt. Cover, and refrigerate dough at least 3 hours (up to 24 hours). The cookies will hold their shape better if you refrigerate the dough for 8-24 hours. Toward the end of the chilling time, preheat oven to 350 F.
Scoops dough using a medium cookie scoop (1 ½ tablespoons). Roll in graham cracker crumbs, and place on prepared baking sheet. Bake for 8-12 minutes. You want the edges to be just barely golden brown. Remove from oven, and immediately press 1/2 tablespoon measuring spoon into each cookie to create an indentation. Fill indentation with fruit filling. Let cool for 5-10 minutes on the cookie sheet. Transfer to wire rack to finish cooling. Full-fat or 1/3-less fat cream cheese will work. I don't recommend using fat-free cream cheese. You can sub up to 1 teaspoon almond extract for part of the vanilla extract. Please be sure to fluff, spoon, and level the flour when measuring. Packing the flour will result in a dry or doughy cookie. would the flour be fluffy if it was put in a sifter? Yes, sifting is a way to fluff the flour. The point of fluffing it before measuring it is just to incorporate air and keep it from being packed down when it is measured in order to get a more accurate measurement. Would it make flour more fluffy if sifted? I made these and followed the directions carefully. Mine tasted really doughy, not in a good way. I could taste the flour. I baked the next batch for longer to see if that made a difference, but it didn’t. Next time I would add a tiny bit of almond extract or roll in crushed almonds like the one post said. The cookie itself was very tasteless. I’m sorry that you didn’t like cookies! 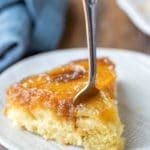 Almond extract is always a great addition to cheesecake. I’m sorry to hear that tripling the recipe didn’t work for you! Unfortunately, not every recipe scales with the exact amounts, and sometimes the recipe needs to be adjusted to scale at that level. I made them but instead i rolled them with crushed almonds..
Soft from the inside and little crunchy from the outside, love love love. I used cherry jelly instead of pie filling. Just as good but less messy. I made these for Xmas and they were slamming good. The mistake I made was storing them in an airtight container and mold formed on the few remaining. Would definitely make them again, but store in refrigerator. I’m so glad to hear that you liked them! Thank you for the note about storing them in the fridge. I’ve added that info to the recipe. Sorry about the “if cranberries” in the 1st line this auto correct really hates me, it has a mean sense of humor! How much graham cracker crumbs were required in total for this batch of cookies? You may need a little more or less, but it should take about 1/2 cup of finely crushed crumbs. How many days ahead can you make these. I think they’re best served within a day or so of when they’re made. They might be able to keep longer if they weren’t filled until just before serving, but I haven’t tried it that way. Have you tried to make these ahead of time and freeze them? I’m sorry. 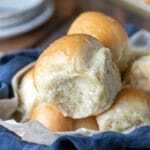 I haven’t tried making these ahead of time and freezing them. 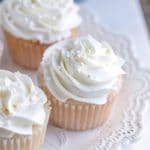 Hello, I’m new I would love to be able to view your recipes. I’m a recipe vacuum. How much salt is needed? Hi! Thanks for letting me know that that info was missing. I’ve updated the recipe with the correct amount. Do these need to be refrigerated. Was thinking of making them for a family picnic. Thanks.. Yes, they will be better if they’re kept in the fridge. Thanks! I’ve noted that in the recipe. In the instructions you mention cornstarch, but it is not listed in the ingredients. How much do you use? We love these cookies, I think the last batch we made used leftover cranberries. In regards to the cranberries, try cooking a package if cranberries with the liquid from a 20 ounce can of crushed pineapple plus 1/2 – 3/4 cup water. While the cranberries are cooking, add a package of Island Pineapple gelatin to the crushed pineapple then add pineapple to the cranberries. Let simmer just a couple of minutes or until all granulation disappears. This can be placed in small containers and kept (covered) in the refrigerator for up to a month. I add 1/2 – 1 tsp. orange zest and replace some of the water with orange juice to the cooking process for a little flavor brightness. This works well with ham (my family use this intend of regular cranberry sauce with poultry), or use like jam with waffles, muffins, etc.